Home »TYPES OF LIGHT»LED Lighting»WiZ and IFTTT – A What, Why and How. Be Smart, Control Lighting from your Phone and More! What and what? I hear you ask. 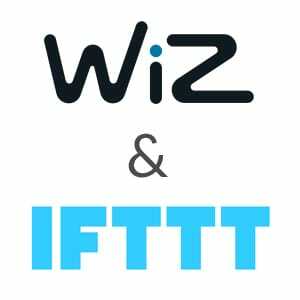 Some of you may already be familiar with IFTTT but read on for the latest on the brand new technology that is WiZ! For those who don’t know about IFTTT then you’ve got the best of both worlds, we’ll be going over exactly what WiZ and IFTTT are, the benefits of using them and of course how to use them. Think of it as your very own guide to controlling your smart lighting. Whether you’re technically minded or a total technophobe both WiZ and IFTTT are things you can get on board with. The prospect and operation of both are in fact very simple, and we’ll help you to realize that. We’ll start with WiZ. So…What is WiZ? WiZ is a brand new form of smart lighting which is set up on your home Wi-Fi network. Unlike many other forms of smart lighting which require hubs, bridges and or gateways, WiZ does not. It is simply a case of plug in, pair and play! 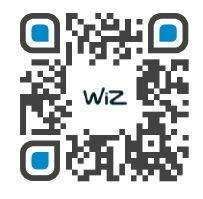 WiZ can be operated by remote control or by its own App from your mobile phone or tablet which can be downloaded from the Google Play Store or Apple Store. WiZ comes in a wide range of bulbs which you can retro fit into your existing fittings as well as integrated fittings from table lamps to ceiling lights. These smart lights are of course colour changing and offer a staggering 64,000+ whites and 16 million colours to choose from! Impressive and very interesting, but…Why use WiZ? It’s a well renowned fact that lighting impacts greatly on how you feel and in turn your mood and mind set. In today’s fast moving world versatility is often difficult to come by, but when you do it’s a blessing! WiZ is just that. Having the right light to work, relax and play is important and you have it all at your fingertips on your own mobile phone. Prepping the dinner? Switch to a cool white. Time for a glass of wine? Bring things down a notch with a relaxing firelight. Change the entire ambiance of your room by highlighting them in your favourite colours, if you’re expecting guests then welcome them with beautiful hues. The possibilities are endless! You also have the ability to schedule your lighting for a certain time and preset via the App, so why not wake up to gradual daylight instead of that horribly noisy alarm? As smart as WiZ is it’s only getting smarter. WiZ connects to the cloud, meaning your personal preferences are stored and as much or as little as you want can be shared with your family and anyone else who you grant access to on the App. WiZ will soon be updating its App to be voice controlled as well as compatible with other Apps and devices including IFTTT for enhanced automation (more on this later!). Providing you have internet access you are able to control the lighting in your home from…Well…Anywhere! Forgetting to turn the light off is now as much a thing of the past as a standard light bulb. 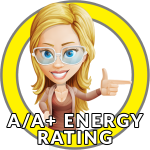 As WiZ uses LED technology in its smart lighting this means it’s extremely energy efficient! Using minimal power and saving on your electricity. Naturally, our very own lighting geek Ellie D approves. I want WiZ! How do I use WiZ? First things first you’ll want to ensure your mobile or tablet is compatible with the WiZ App. As long as your device is iOS 8 or higher, or Android 4.1 or higher then WiZ will work. It is not available for Windows Phones or Blackberry. To get the App head over to the Google Play Store on Android or the Apple App Store on Apple, alternatively feel free to scan the QR code shown (right). The WiZ App allows full control of your lighting from your fingertips. Create homes, rooms, groups and control everything down to individual lamps. 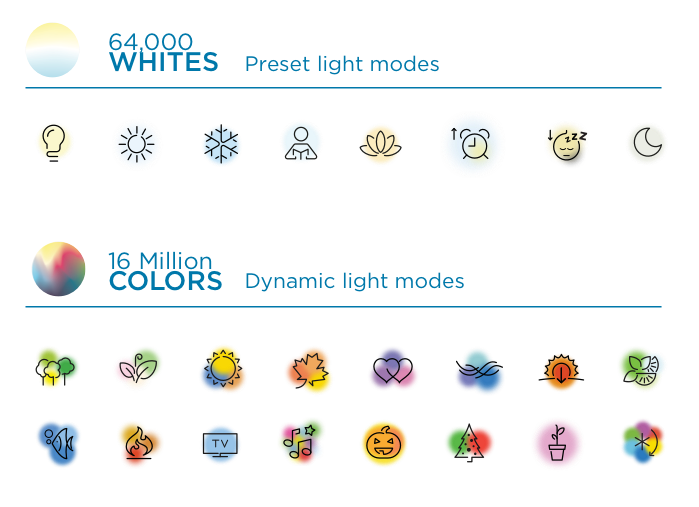 Change the colour of your lights with a choice of 64,000 whites and 16 million colours as well as multiple presets. Invite family and friends to allow them to control as much or a little as you wish. Change the brightness with dimming sliders and even create schedules for automated lighting. The WiZ Mote is available separately and can be customized via the App. It is an infrared controller which is simply point and click to control lights and groups of lights, much like a TV remote. Turn lights on or off, control the brightness and select from 4 presets which can be assigned via the App. WiZ Click makes your existing switched that little bit smarter. Assigned via the App (as per WiZ mote) your WiZ lights will recognize how you use your light switches. Flicking your light switch on once will see it initiate with your favourite light mode (1). Flicking the switch on again within 5 seconds of switching it off will see it initiate with your favourite light mode (2). This allows quick operation between your two most used settings at the flick of your existing switch. Finally WiZ can be operated with WiZ Magic. This is a multitude of super smart operations which is continuously growing but is set to include scheduling, voice control and integration with other smart devices and Apps including IFTTT. Those of you that know about IFTTT will be rather pleased to hear this, and those of you that don’t are desperate to know about it by now and why it’s great for WiZ. Let’s make things clear for you by telling you what it stands for. IF This, Then That. It’s a pretty simple concept is it not? It’s a way of connecting Apps and devices using this simple statement. It is in fact an App itself which you can download from the Google Play Store on Android or Apple App Store on your Apple device. Okay, so what can it do? How do I use IFTTT? If the current temperate drops below 5 degrees then send a text message to myself, “wear a coat!” perhaps? It’s rather unlikely you’re even asking yourself this question. The benefits of IFTTT speak for itself but it compliments the WiZ lighting system perfectly. Smarter automation will make your life so much easier, imagine – “if I miss a phone call then turn my lamp red”, “if my GPS says I’m at home then turn on my entrance light”. The creative control is yours, be it functional or fun. We hope this blog has helped you to understand smart lighting and eased any technical worries giving you every reason to get on board. Welcome WiZ and IFTTT to make your home the smart home that works for you. It may interest you to know we have a full FREE digital magazine full of inspiration content and offers. Feel free to sign up to our newsletter below to become one of our enlightened VIP’s and receive your FREE copies now!